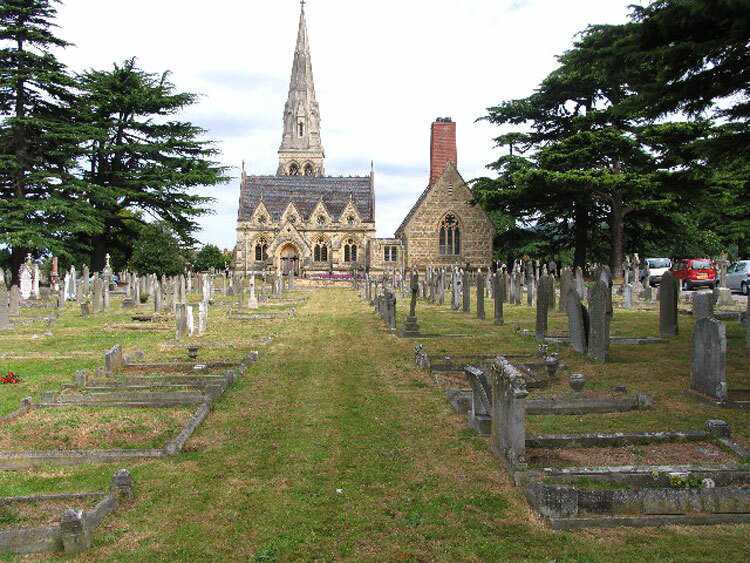 Cheltenham Cemetery contains burials of both wars. 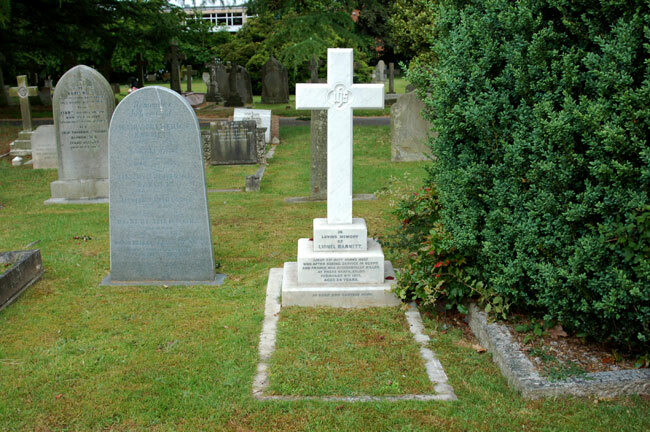 The 109 First World War graves are mainly of men who died in the local voluntary hospitals. The burials are scattered except for a small plot of 10 Australian graves. The Second World War burials number 71, half of them forming a war graves plot in the eastern part of the cemetery. Amongst the graves for the First World War is that of Lieutenant Barnett, of the 6th Battalion Yorkshire Regiment. We are extremely grateful to Richard Roberts (<richard.nsw@googlemail.com>). 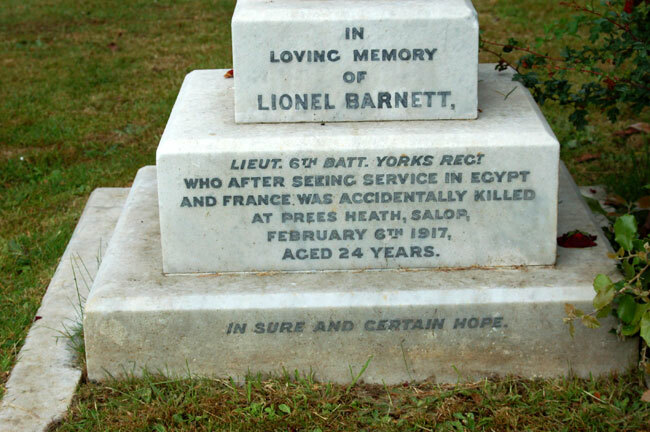 who has provided the photographs of Lieutenant Barnett's grave and further information on Lieutenant Barnett. There is also a family grave on which an Officer of the Yorkshire Regiment, Lieutenant Graham Hicking, is commemorated. Remarkably, this family headstone also commemorates his brother who was killed on the same day. We are extremely grateful to 28TH61ST+ONE. 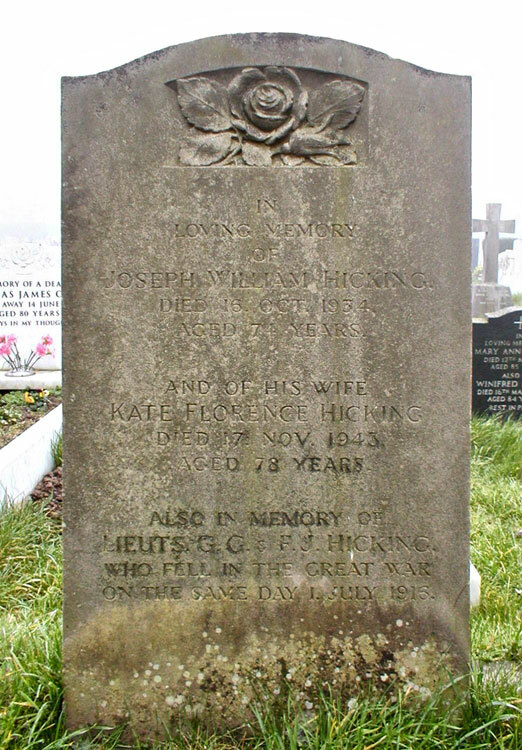 who has provided the photograph of the Hicking family headstone. Lieutenant Lionel K Barnett. 6th Battalion Yorkshire Regiment, formerly 5th Battalion Gloucester Regiment. Husband of M. E. Barnett, of Mill House, Lower Alstone, Cheltenham. Died of wounds 6 February 1917. Aged 24. Further details on Lieutenant Barnett can be found on Photos of Individuals, - "B". ON THE SAME DAY 1 JULY 1916. 6th Battalion York and Lancaster Regiment, formerly 11th Battalion the Workshire Regiment. Son of Joseph William and Kate Florence Hicking, of Halsey House, Pittville, Cheltenham, formerly of Ruddington, Notts. His brother Francis Joseph Hicking also fell. Killed 1 July 1916. Aged 22. Commemorated on Addenda Panel, Pier and Face 4 C, THIEPVAL MEMORIAL. (Lieutenant Hicking was one of a number of 11th Battalion Officers who fought with other regiments from early 1915 onwards. His brother, 2nd Lieutenant Francis Joseph Hicking was killed on the same day aged 19, and is buried in FRICOURT NEW CEMETERY.